Schweid & Sons is a family-owned and operated, fourth generation, high-quality ground beef purveyor supplying restaurants, grocers, and special events. In the late 1800s, Harry Schweid began selling quality meats to butchers and restaurants in New York City’s Lower East Side. By the 1930s, his son Sam Schweid continued in his father’s footsteps and established a successful meat shop in Harlem. In 1978, Sam’s son David Schweid took his family’s long withstanding heritage in the meat purveyor industry and founded Schweid & Sons, a company that would focus on one product – ground beef. 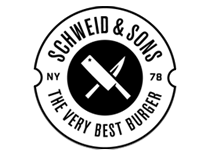 Today, that same passion, commitment, and work ethic is carried on here at Schweid & Sons through David and his two sons Jamie and Brad, all with a dedication to producing the best tasting, highest quality burger. Located in Carlstadt, New Jersey, our mission is to bring “The Very Best Burger” to customers by offering a range of high quality ground beef blends and products. All our ground beef is inspected or certified before it enters our shop. We have received a Safe Quality Food (SQF) Level 3 Certification, the highest level given by the World Standard for Safety initiative. We use the same suppliers year-round to guarantee consistent quality and flavor with each burger and ground beef blend. There is no aged steak, no bench trimmings, or any artificial coloring in any of our ground beef products. We are proud to supply our high quality ground beef to burger fanatics Nationwide for nearly 40 years and thank you for giving us the opportunity to continue serving you.